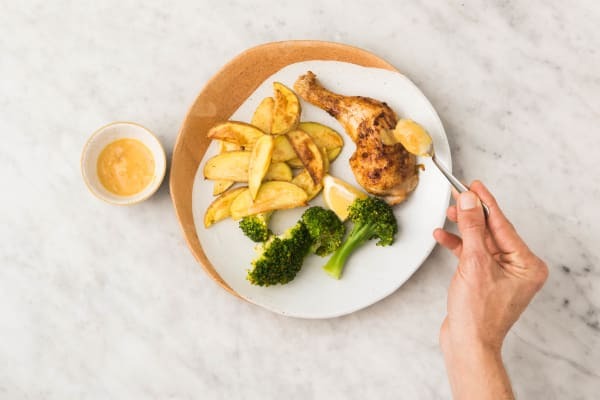 Get a leg up at dinnertime with this recipe that has all the flavors, like apricot jam, Dijon mustard, and a hint of lemon swirled into a delectable glaze for crispy-skinned roasted chicken. Each bite of juicy dark meat feel like a revelation of sweet, savory, and tangy flavors. And it only gets better when you factor in the sides: potato wedges seasoned with warm spices and easy-peasy microwaved broccoli with a touch of lemon, butter, and chili flakes. Adjust racks to middle and upper positions and preheat oven to 450 degrees. Pat chicken dry with a paper towel. Season all over with salt, pepper, and paprika. Place on a baking sheet skin-side up. Bake in oven on upper rack until cooked through and skin is crisp, about 30 minutes. Wash and dry all produce. 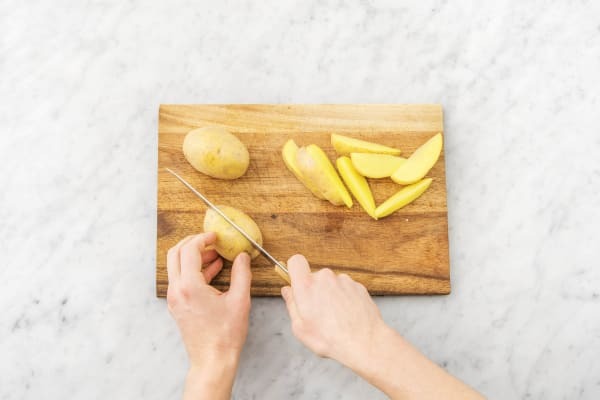 While chicken bakes, cut potatoes into ½-inch-thick wedges. 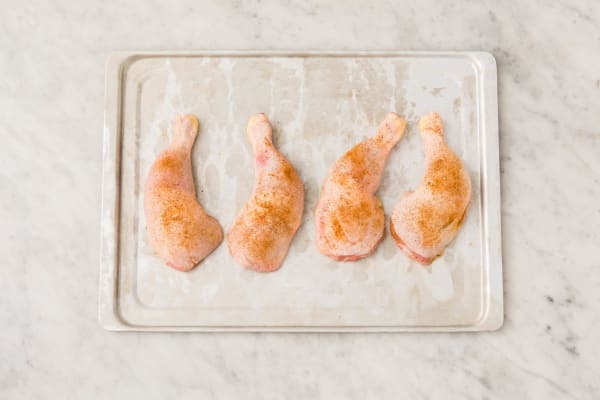 Toss on a second baking sheet with salt, pepper, fry seasoning, and a large drizzle of olive oil. Bake in oven on middle rack until browned and tender, about 25 minutes. Meanwhile, zest lemon until you have 1 tsp zest, then cut into quarters. Place jam, mustard, and 1 TBSP butter in a small pot. Heat over medium heat while whisking until smooth, about 2 minutes. 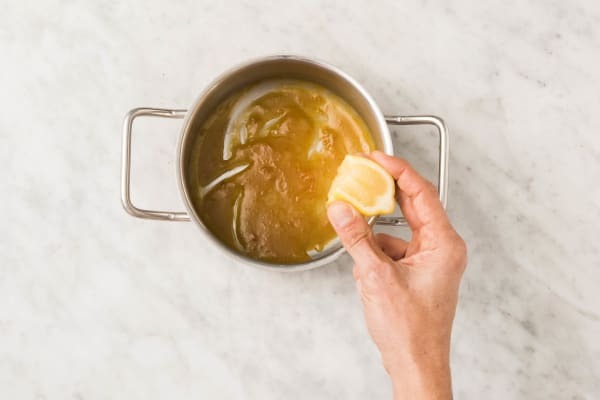 Remove pot from heat and stir in juice from 1 lemon quarter. Season with a pinch of salt and set aside. 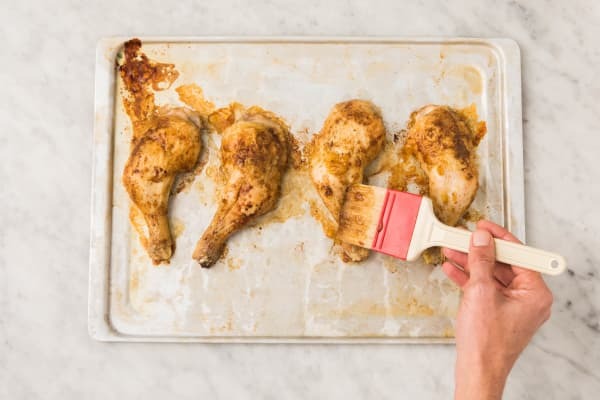 Once chicken is cooked through, remove from oven and brush with half the glaze. Return to oven and bake until glaze is tacky and has dried out a little bit, 3-5 minutes. Place broccoli in a large microwave-safe bowl with 1 TBSP water. Cover bowl with plastic wrap and poke a few holes in wrap. Microwave on high until tender, 4-5 minutes. Carefully remove wrap, then drain water from bowl. Stir in lemon zest, 2 TBSP butter, and a pinch of salt and pepper. Sprinkle with chili flakes to taste. 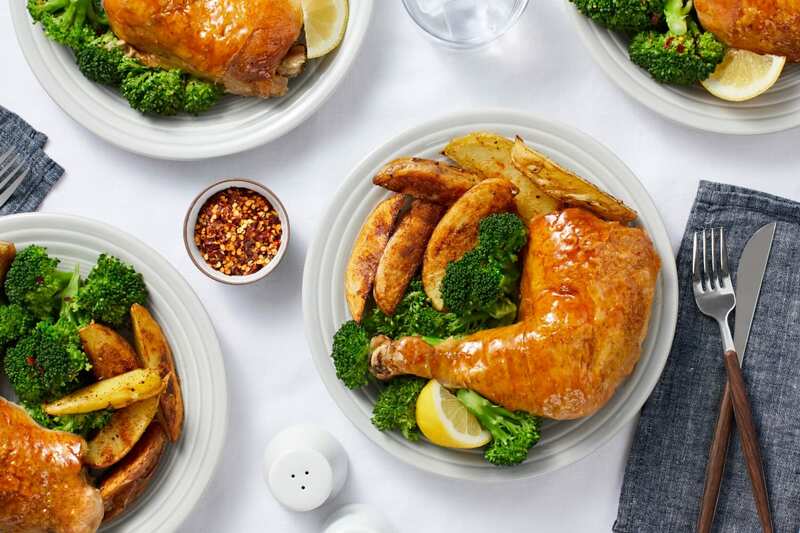 Divide chicken, broccoli, and potatoes between plates. Drizzle remaining glaze over chicken. Serve with remaining lemon quarters on the side for squeezing over.